View our calendar of events and register for future meetings. Become a member of SAME Honolulu. Learn about our efforts to reach out to future generations of engineers and small businesses. 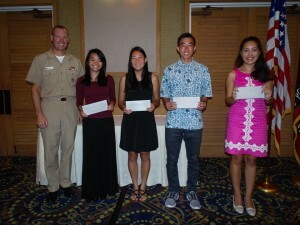 2019 SAME HONOLULU SCHOLARSHIP PROGRAM – ACCEPTING APPLICATIONS NOW! SAME Honolulu offers scholarships to deserving high school seniors and college students who will be or are currently enrolled at a university with an accredited engineering or architecture program. Download the 2019 scholarship application here. NEW SAME HONOLULU POST WEBSITE COMING SOON! SAME Honolulu Post website will migrate to SAME National’s website platform in April 2019. For now, all event announcements and important information are listed on this homepage. For inquiries on the 2019 SAME Honolulu Post Scholarship Program, email Scholarship@samehonolulu.org. For all other inquiries and regular lunch meetings, email info@samehonolulu.org. April 10, 2019 (Wednesday) – Registration is now open. Click here to register. May 13-14, 2019 – 2019 Pacific Industry Forum (Ice-breaker Reception on May 13, Forum on May 14) – Registration is now open. Click here to register or sponsor. Download the sponsorship and individual registration package here! Download the sponsorship levels and benefits here! For more information about the Pacific Industry Forum and Icebreaker Reception, please email info@samehonolulu.org. Mahalo to the following generous sponsors for the 2019 Pacific Industry Forum! As your registration comes in for the 2019 Pacific Industry Forum, your name will be listed below. Platinum Sponsors: Sam O. Hirota, Inc. Presentation Synopsis: In this presentation, Rigo will present how JACOBS balances the constraints and challenges inherent to operating and maintaining an Advanced Facility in OCONUS while driving value to ensure the reliability and readiness of the facilities for a contingency event.